Continuing with part 6 in this series, I want to share a few more titles with you that have made a difference in my life. You can find parts 1-5 of The Desk Series listed on the sidebar. The first book for this third post in the area of books is of course, Fervent: A Woman's Battle Plan for Serious, Specific, and Strategic Prayer by Priscilla Shirer! I could go on and on about Priscillia and the wonderment of her gift in ministry. She is on fire for Jesus...we need more to step out with that kind of fire today! I will have more to post on her work once we move to studies. The book, Fervent was inspired by the movie, War Room. That movie was a game changer for women and prayer "closets" began springing up in a lot of homes because of it. If you need a reminder of it's inspiration or you have never watched it for yourself...here is a clip. I found it a fantastic movie which reminds me I want to get my copy out and watch it again. The book is broken down into strategies using precise topics in which to pray. If you want to build your prayer life and need a bit of help, do read and study this book. I am sending along the little videos that go along with each strategy and they are free! You can begin here with week 1 and conclude with the 11th week being her final thoughts. They are awesome and go along with personal study so well. Enjoy! The second book for this post is The Divine Mentor: Growing your Faith as You Sit at the Feet of the Savior by Wayne Cordeiro. I like this book because the author reminds us of mentors in the Bible. Also, he guides us to and through commitment and devotion in order to put time aside for study and the importance of getting in the Word and staying in the Word. One chapter reminds us how important 5 things are; Bible, pen, journal, Bible-reading plan and a daily planner. I would agree since this entire desk series is devoted to items I have found to enhance my quiet time. Personally, I have used this method somewhat over the years, but it tends to keep me a bit more structured than I want to be. However, it is a great place to begin...find the scripture, tell what it says in your own words, how can I apply it to my life and finish with prayer. I just finished reading and studying the book of Hebrews using my own method which I will share with you in a future post. Also, the author speaks strongly of the "fruit of daily devotions", telling us to "Look intently". "God isn't inaccessible. He's neither coy nor introverted. But He does require us to seek Him. This hones our hearts and purifies our motives. And the ancillary benefits are manifold. Seeking and searching for God builds our faith, like pecking out of the shell strengthens a newborn chick." You know the more we do something, the better we will be at it. 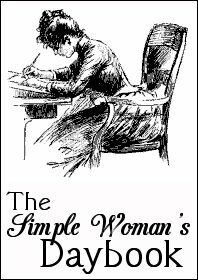 The Simple Woman's blog hosts The Simple Woman's Daybook (created 2008), a once-a-month post that blends a slow and simple, yet thoughtful set of prompts with community. ** See down the sidebar for the current edition. Along with the once-a-month Daybook, you will find posts written that I hope bring encouragement and inspiration to your day. Please do not use images, content or original ideas from this site unless notes or permission is granted.